Metamagician and The Hellfire Club: Sunday supervillainy - Donald Trump as the supervillain M.O.D.A.A.K. 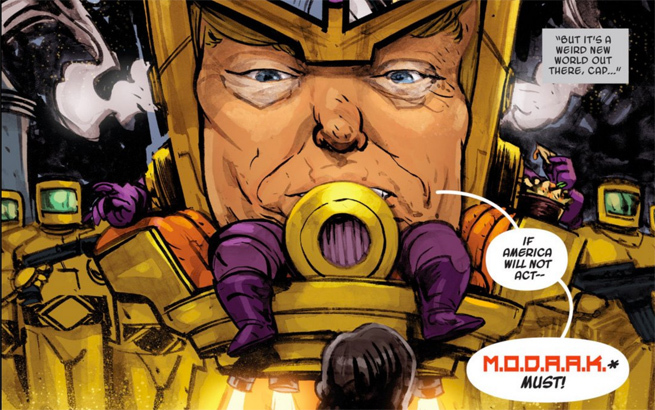 Sunday supervillainy - Donald Trump as the supervillain M.O.D.A.A.K. I don't read a lot into Marvel's decision to do this - it's surely just a bit of slightly satirical fun - but in the spin-off universe of "Spider-Gwen" the prominent supervillain M.O.D.O.K. (Mental Organism Designed Only for Killing) has been reimagined as something of a Donald Trump lookalike, and with the new name M.O.D.A.A.K. (Mental Organism Designed As America's King). This has been getting quite a lot of international coverage, including a story in the India/US crossover newspaper the Indian Panorama. I assume that M.O.D.A.A.K. has similar psi-based powers to the original M.O.D.O.K., but I can't confirm this or report on how the swollen-headed, tiny-handed villain fares in battle. Should there be a Nobel Prize for Philosophy?